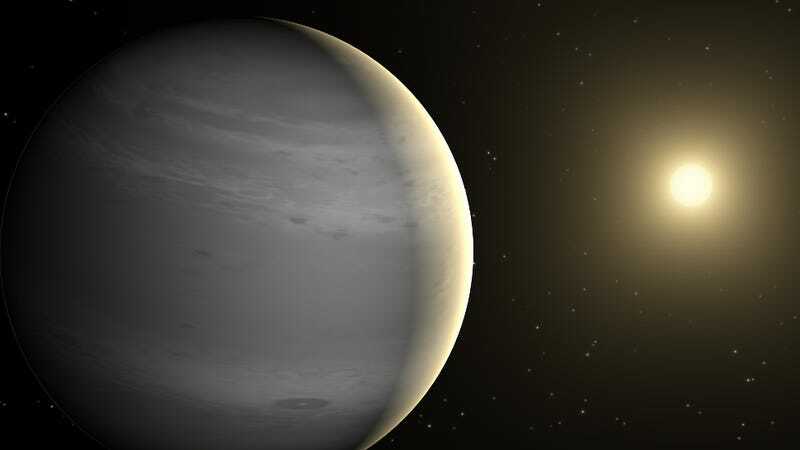 Yesterday, news made the rounds that a team of Russian astronomers had detected an unusually strong signal emanating from a nearby sunlike star—a possible indication of an alien civilization. Here’s what the detection of this signal really means, and why it’s probably not ET. To quickly recap, scientists using the RATAN-600 radio telescope in the Russian Republic of Karachay-Cherkessia detected an unusual signal emanating from a star, designated HD164595, located about 94 light-years from Earth. The anomalous radio pulse was detected in May of 2015, but the scientists made their discovery public just this week. The researchers, who will discuss their findings at an upcoming meeting of the IAA SETI Permanent Committee, are calling for permanent monitoring of this target. Exciting, right? Well, yes and no. It’s way too early to tell if this is a signal from a sophisticated alien civilization, or if it’s even a signal at all. But it’s the nature of this particular planetary system that makes the blip in the data so tantalizing. HD164595 is located less than 100 light-years from Earth, which means it’s practically next door by cosmological standards. If there’s someone there, we could engage in two-way communication with a 188-year turn around time. This system also features a very sun-like star, in terms of size and chemical composition. It’s a bit older than our sun, so there’s conceivably been more time for an alien civilization to emerge and develop. HD164595 also features a warm Neptune-like planet, which probably isn’t conducive to life (unless its moons are somehow habitable), but this system might host other undiscovered planets, including rocky ones. This region of space is obviously worth checking out. The strong radio pulse has attracted the attention of the SETI Institute, prompting its scientists to perform their own scan of HD164595 using the Allen Telescope Array. So far, their search has yielded nothing, but SETI hasn’t covered the full range of frequencies in which the signal could be located. And in an effort to be thorough, the METI Institute is also planning to observe the star from an optical SETI observatory in Panama in case aliens are sending us messages through powerful beams of focused light. But there’s another reason why HD164595 is getting so much attention, and it has to do with the way it was announced to the world. As the SETI Institute’s Jill Tarter explains, it’s because one of the scientists on the team sent around an email with the title, “Candidate SETI Signal Detected”—an email that reached Paul Gilster of Centauri Dreams, who made it public (Gilster did so after confirming that the email was public, and did not disclose private information). “This process contradicted the common sense protocols that we’ve tried to develop over the years, and was announced without ever seeing the signal again, without any other facility confirming it, or even being asked to try to do so before public announcement,” Tarter told Gizmodo. Just as strangely, the researchers waited 15 months to share their findings. That’s not just weird, it’s anti-scientific. It would have been wise to alert as many people as possible in hopes of re-detecting and confirming the signal. Bottom line: this freaky signal is probably not extraterrestrial in origin. Scientists pick up radio pulses like these all the time, but they rarely repeat (an important condition for verification), and they’re often produced by naturally occurring phenomenon, such as solar flares, the microlensing of a background source, an active galactic core, or even a satellite passing by. Last year, Australian researchers traced an unexplained radio signal to a pair of onsite microwave ovens. Tarter says there any many reasons why alien hunters might be inundated by false signals, including “all those folks walking around playing Pokémon GO,” as well as our voracious appetite for data and media broadcast from the skies. “We live in a noisy world—even at higher frequencies,” she said. It’s also not clear if the Russians are completely correct about where this radio signal is coming from. The RATAN-600 radio telescope used by the scientists is fairly unconventional, so other observatories will have to confirm the precise location of the signal. But that would require another anomalous signal, which may never happen again. “Unlike a clean, clear aperture, offset parabolic dish, the sidelobes on the RATAN-600 are really squirrely,” said Tarter. “I think the signal could have come from a lot of directions, although the team argues that it did reproduce the beam shape for a point source drifting through—almost.” She is skeptical that the signal is coming from an alien civilization, saying one telescope is not enough to make a determination, and that telescopic arrays are much more reliable. Also, the Russians used a dish with a rather large bandwidth to make their observations. Searching at 1 GHz, that’s about a billion times wider than the bandwidths typically employed by SETI, and about 200 times wider than a TV signal. According to Seth Shostak of the SETI Institute, the strength of the signal was 0.75 Janskys, which he described as “weak.” He said the wide bandwidth of the Russian receiver may have diluted the strength of the signal. Still, to produce such a signal, an extraterrestrial civilization would have to be capable of collecting a tremendous amount of energy. If the transmission beam was broadcast in all directions, the aliens would have tap into the energy produced by its sun, like using a Dyson sphere (making it a Kardashev Type II Civilization). If the beam was targeted directly at Earth (perhaps they detected biosignatures or early industrial pollutants, making us a good target candidate), they would need less energy, but still more than our civilization is capable of producing (meaning they’d be a Kardashev Type I Civilization). Either way, if there’s an extraterrestrial civilization at HD164595, it has to be pretty damned advanced. So advanced, in fact, that if they really, really wanted to get our attention, they would have made their signal stronger, more persistent, and much more obvious (e.g. an actual message embedded in the signal, such as a string of prime numbers). Given that a repeat of the signal has not been detected by anyone, it’s a good sign that there’s nobody there. It’s certainly possible that the pulse was produced by alien radio leakage, but that seems unlikely given its apparent strength. On its own, the single data point produced by the Russian astronomers is insufficient to make the case for aliens at HD164595. In fact, it’s not even close. But that’s not to suggest that follow-up searches and investigations aren’t warranted. If we ever finally detect an extraterrestrial civilization, it may very well come from an anomalous radio pulse such as this. Under [the RATAN-600 SETI] program, in 2015 on one of the objects (the star HD164595 system in the constellation of Hercules), it was detected interesting radio signal at a wavelength of 2.7 cm. The processing and signal analysis revealed that the most likely, it’s still a signal of terrestrial origin. By terrestrial they mean the signal likely originated from Earth. Last year the RATAN-600 telescope in Russia heard a strong radio signal from the Sun-like star HD 164595, 95 light years away in the Hercules constellation. The Breakthrough Listen team at UC Berkeley has now taken observations in the direction of the star, using the 100-meter Green Bank Telescope (GBT). A preliminary analysis of the observations detected no source at the position and frequency of the source, to a sensitivity of 10 milliJanskys (a measure of spectral irradiance). This measurement does not rule out the possibility that the RATAN result was an artificial signal, but it did not find anything to confirm it.